Here are three variations on an old classic, Barbie Bungee. What do you notice? I most likely would use a variation of examples 1 and 2. 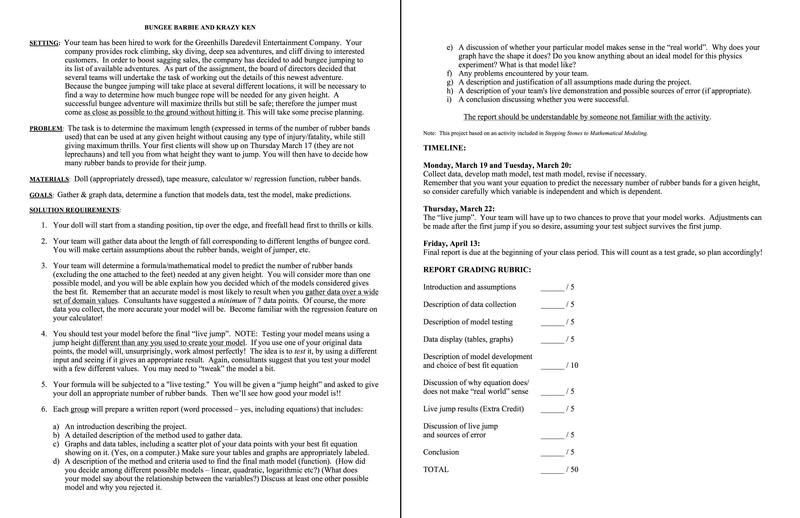 Example 3 is too wordy for me and the students that I work most closely with. I like how example 2 pushes for the interpretation of the slope and the y-intercept. I also LOVE having my students name their Barbies…they enjoy that! Example 2 misses the estimation part…while example 1 asks for it, but at the end of all the directions (when we KNOW that students will start working before they’ve read all of the directions). I’m wondering if you’re getting at the point that there is never a “just right” already created lesson/activity? Just sayin’ ….I’ve regularly used a variation of Fawn’s version…I like that she included images of the Barbie dangling and how to tie the rubber band knots. You can’t subtract but you can always add. That is why I am leaning towards number 3. I like that the students are designing how they will collect the data. I want them to see the value of building a mathematical model leading them as little as possible. I don’t think I would hand them all of the pieces at the beginning. I really want all of their energy to be focused early on the task rather than the product. Perhaps start with the setting and problem. Describe or demo the ultimate task (without giving drop height). Ask them what information they need and let them go. I can add the other stuff as the days progress. I can be prepared to intervene in groups and help their struggle become productive. The third one seems the easiest to start thin and add as necessary. I teach physics, so my views may be different than those who teach math. I’m also more likely to assign what I call “Single-sentence labs” where the class is simply given a goal to achieve or an concept to explore, so I’m also biased against the use of so much text in an exploration such as this. #2 sets up a graph and a data table(I think?) but only has room for 3 values. Labeling the graph and setting up the data table takes away the opportunity for the students in the class to discuss what data is appropriate and how best to display it for analysis. 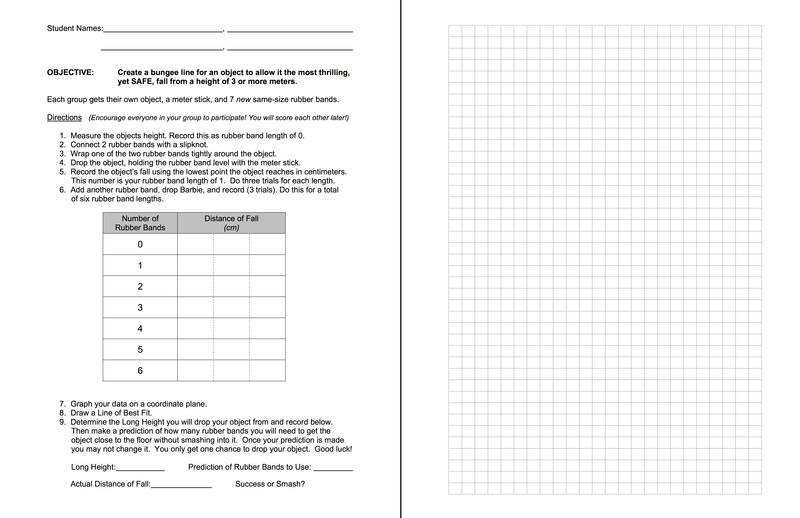 On the other hand, this activity is structured in a way that could make for good scaffolding if the labeled parts (1-4) were trickled out to the class. I would like to see students generate their own variations on the questions asked in parts 3 and 4 before they see all of these questions, though. Maybe the class comes up with more interesting questions than the teacher. #3 at first glance to me looked like a classic “cookbook laboratory” simply because it had so much text! On closer inspection, I see that the structure of the activity is a lot more open ended than I expected based on the amount of text I initially saw. So, I like that. Steps 1-5 are an interesting way to describe what might be called a scientific method. It’s too much text for my taste, but maybe that’s just my style. 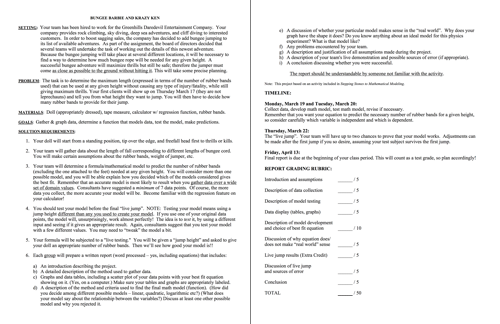 Step 6, on the other hand, is really setting up a checklist of things for students to accomplish at the end in order for it to “count” for the class (see rubric at the end), and therefore my fear is the joy of exploration and discovery is replaced with the worry of fulfilling a checklist. Dislike. #1 May actually be my least favorite, because it seems exactly like a cookbook lab handout. All prescription, no thought required. (And the missing apostrophe in step 1 made it hard for me to want to read the rest of it, but that’s just me…) On the plus side, the students have to determine how to set up the graph. 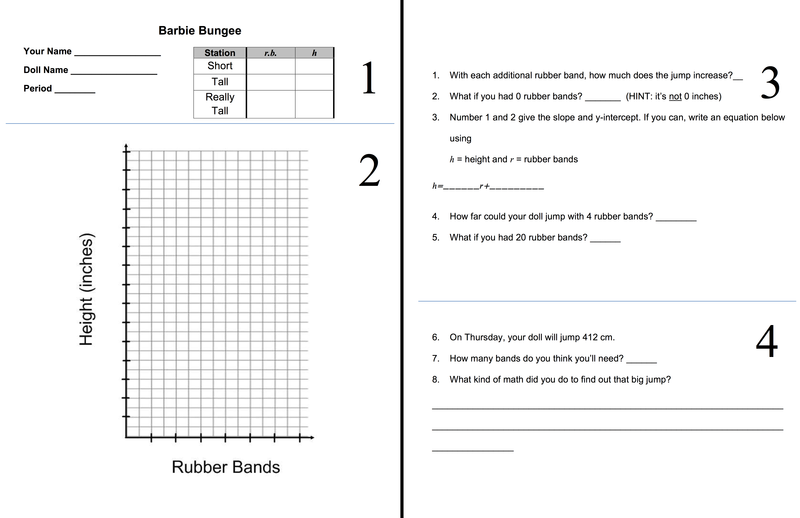 The recent discussions of the barbie-bungee jump remind me of how much I wish there was more cross-collaboration between physics and math teachers when applied math examples are used. I really think we could learn from each other. Great idea comparing resources for the same task. This obviously requires a number of assumptions about the students, and also about the goals of the teacher and the goals of the curriculum. For example, if I assume that the students have no experience of project based mathematics and modeling, and I simultaneously assume that the teacher wants to begin that journey with a highly structured task in which they want to focus on the methodology of modeling rather than say writing up a report, then I might pick version 1. If I make different assumptions, such as assuming the students do have some experience with modeling but little experience writing a report, then I may pick Version 3. Whilst it depends heavily on the students in front of us, I would say that personally I’d want to discuss the mathematical tools that the students could utilize for this project rather than lay them all out akin to having a set of instructions to follow. I’d want them to think about the tools they could use and then critically discuss those together. 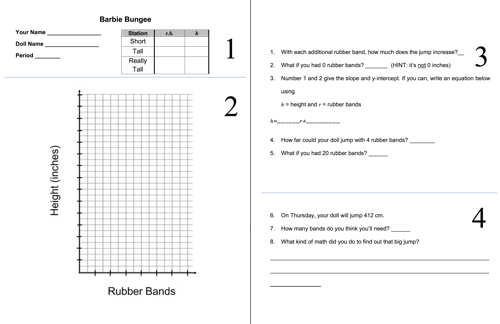 However, without knowing a lot more about the students these worksheets were developed for, I can’t evaluate whether they would effectively meet each individual teachers goals for student learning. I think I answered all questions at least partly. What would be great is to create assumptions, and then vote on the version that we think aligns most closely with those assumptions. Then create a different set of assumptions and go through the same process. If I were the student, I would want to do version 3. It might be too wordy, but if this was the first time completing a task like this I would want all of the information. As the teacher, my goal would be to continue offering activities like this, but giving less information each time. I did this lesson with my Grade 6’s this year and they loved it. I think the difference is what age you are doing this with and what your goal is. We used a more inquiry-based version of number one to teach how to use a graph to predict values. We did not limit the size or number of the elasticity and allowed them to figure out what would matter themselves. The project was also used as a lead-in to input output tables and finding the expression. 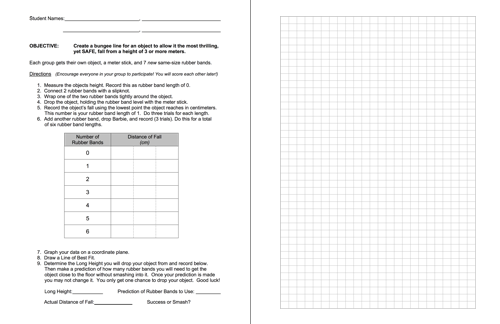 Version 2 is boring and version 3 I would use with my grade 7’s who have more experience with graphing and expressions as well as PBL. I first create the need. Here is the video i use to create the need for doing the barbie bungee. 2. How do we make sure we don’t make the same mistake?